We are thrilled to announce that the inaugural SWIP CH Networking Conference will take place on 23-24 November 2018 in Bern! 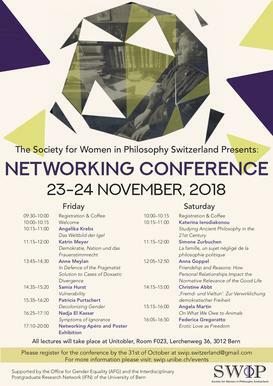 This event has the goal to connect philosophers working in Switzerland by creating a space where they can network, share their work, and receive feedbacks. 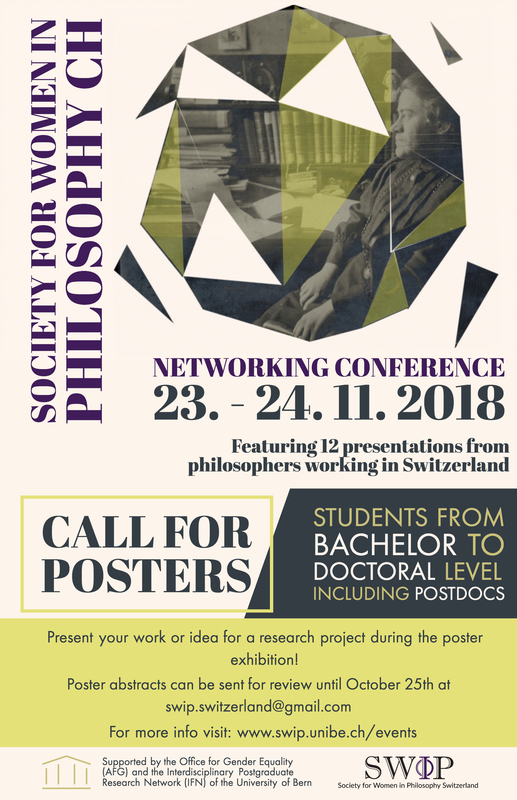 The conference hopes to facilitate synergies in current and future philosophical research across Switzerland by providing students of all levels the opportunity to learn about the work of philosophers in Switzerland and thereby get to know future supervisors and topics, as well as share and develop their ideas and projects. Additionally, it has the overall aim of promoting the visibility of women working in philosophy in Switzerland. The conference will include 12 presentations from established philosophers working at Swiss universities. They will give a short presentation of their current topic of study and present a brief review of their field of research. These philosophers include: Angelika Krebs (University of Basel), Katrin Meyer (Universities Basel and Zurich), Anne Meylan (University of Zurich), Samia Hurst-Majno (University of Geneva), Patricia Purtschert (University of Bern), Nadja El Kassar (ETH Zurich), Katerina Ierodiakonou (Universities Geneva and Athens), Simone Zurbuchen (University of Lausanne), Anna Goppel (University of Bern), Christine Abbt (University of Lucerne), Angela Martin (University of Fribourg), Federica Gregoratto (University of St. Gallen). The conference will be accompanied by a Poster Exhibition that will offer the opportunity for university students at all levels (from bachelor to doctoral candidates, as well as PostDocs) to present their work to a wider audience. If you are interested in participating please register until October 31st (*deadline extended*) via email to swip.switzerland@gmail.com. This event is public and will take place at the University of Bern / Unitobler (Lerchenweg 36). It is financially supported by the Office for Gender Equality (AfG) und dem Interdisciplinary Postgraduate Research Network (IPN) of the University of Bern. Organisational Team: Melanie Altanian (University of Bern), Stephanie Deig (University of Bern), Jahel Manz (University of Bern), Tanja Rechnitzer (University of Bern), Laetitia Ramelet (University of Lausanne), Leire Urricelqui (University of Lucerne), Karen Poertzgen (Universität Bern).